We offer Safety Switches for conveyor and material handling plant. These are the specially developed field mounted enclosures with added safety features. Fabricated using advanced technology, the switches are dimensionally accurate and are available in various configurations. Resistant to temperature and voltage fluctuation, the range is used in steel, mining, cement, fertilizers and power plants. Customization is provided as required by the client. Universal (common) Cast Aluminium/ DMC enclosure. Same overall and general mounting dimensions and hence reduction in variety of mounting brackets. Rationalized design and construction allows inter changeability of parts. Special rubber seal (0 ring) on shaft for better protection against ingress of dust, dirt etc. Special Ring & Overlap Fitting to prevent ingress of dust & water. DMC (FRP) enclosure for use in corrosive environment. Pull cord switch also known as Rope Operated Emergency switch is used as a safety switch to stop the conveyor belt in case of an emergency. It is also known as pull switch cord. Now a days in material handling plants under/Over speed monitor is one of the essential control and safety device. Electronic Speed Monitor is used to monitor speed of conveyors, crushers, rolling mills, agitators, mixers, stirrers, screw conveyors, and other industrial machinery. This device actuates relay contacts at preset speed. Using these contacts desired control action such as zero speed protection/ under speed protection/ over speed protection can be achieved. It Senses speed by non-contact way. Hence no moving parts. No wear and tears of rollers or misalignment of couplings. Built in initial by-pass time delay arrangement. Speed setting possible from 1 RPM to 5000 RPM in optional ranges. 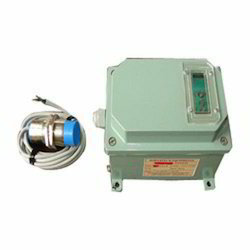 Totally enclosed sensor, works in presence of dust, dirt water, oil & chemicals. Direction sensing and speed monitoring of various locations from single point is possible. Intrinsically Safe Sensors and speed switches with Flameproof Enclosures are available for use in Hazardous area. The basic principle of speed monitor is comparison of pulses received from sensor with standard pulses. The unit consists of two parts: CONTROL UNIT and “SENSOR PROBE”. The sensor is to be installed with its sensing face in close proximity of rotating object. On this object, flags are to be fixed. The sensor products strong electromagnetic waves, which get disturbed by the flags, giving rise to corresponding pulses. These pulses are fed to the control unit where they are compared with standard pulses to sense the speed. The control unit incorporates an output relay. This relay will operate at preset speed giving 2C/O contacts of 5 Amp 240 VAC resistive. The model is provided with potentiometric setting. Suitable speed range is to be selected from six optional speed ranges 1-10, 10-100.5-50, 50-500, 100-1000 and 500-5000RPM.It also has a special optional facility to multiply speed range X 10 & X 100. 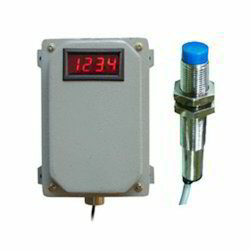 Easy speed setting by potentiometer, with supply ON `Relay ON’ and `SENSOR LED’ indication. Micro Controller based circuitry packed with customer friendly features. 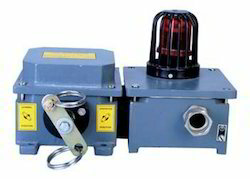 Heavy duty limit switch are extensively used on EOT cranes, conveyors, transfer cars, elevators, steel mills and mobile/ material handling equipments for sensing of end limits and position sensing.